The FH-Series of fire hose testers meet or exceed test standards set forth by the NFPA (1962.5) and the RMA. 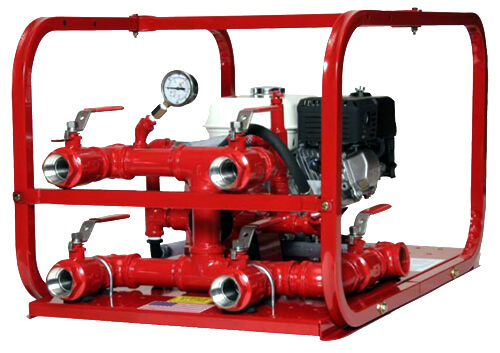 The FH-Series is capable of testing fire hose up to 6" in diameter. A large 2-1/2" inlet allows the user to quickly fill and bleed the lines through a 1 & 1/2" manifold. 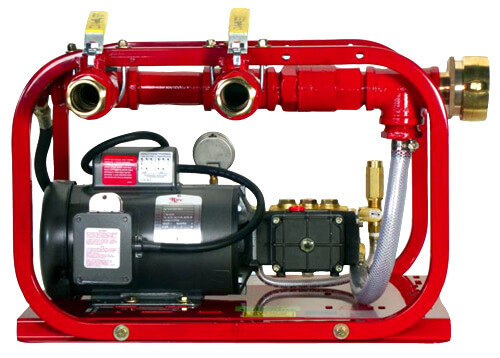 NO WILD LINES - Unique to the FH-Series of fire hose testers, is a ballvalve strategically placed on the inlet piping that allows the user to fill the lines with "LARGE VOLUME at LOW PRESSURE" and test with "LOW VOLUME at HIGH PRESSURE", eliminating the elements that may cause wild lines. All units in the series have a stainless steel liquid filled gauge that ensures accurate readings, with less flutter. Applications Include: The FH-Series of firehose testers are a safer, less costly and more efficient way to test your fire hose, keeping your pumper how it should be… ready for action! 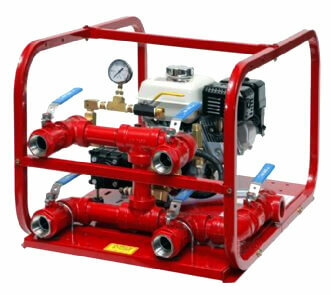 Shipping Dimensions: 28" x 23" x 19"
This is a MINI fire hose tester with all the power and design. Ideal for on board ships, inside factories and plants or any confined spaces. Shipping Dimensions: 35" x 25" x 19"
Shipping Dimensions: 35 " x 25" x 19"
These fire hose testers are excellent for testing requirements in rural and remote areas, or anywhere electricity is not readily available. The Line Cage is a new, patent pending, safety secure and anchoring device for use in fire hose testers. The Line Cage was designed by a Fire Captain, with the safety and well being of his fellow firefighting brothers in mind. Manufactured with high volume at low pressure to fill the lines, and low volume at high pressure to test, eliminating the cause of an uncontrollable wild line from rupture or failure during testing. The Linecage is designed with multiple locking holes to accommodate various hose sizes. NOTE: Meets NFPA 1962 5-5.2.3 requirements of "Securing and Anchoring" the fire hose while being tested. High quality and great range of sizes and capacities to meet most needs.